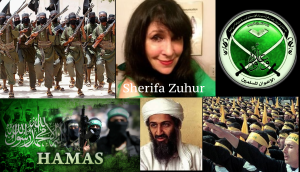 UTT had an interesting exchange on twitter this weekend with Sherifa Zuhur, an apologist for America’s enemies – specifically, terrorist organizations. Amid the social upheaval in response to President Trump’s travel ban from seven Islamic countries, fomented by the hard left Marxist/socialist groups and their anti-American counterparts – jihadi groups like Hamas (doing business as CAIR), ISNA, and others – UTT feels it is important to share this experience publicly because Americans need to know what they are up against and what to expect as this war in America goes forward. The exchange began in response to UTT’s (@UTT_USA) tweet: “No surprise – SecState Madeleine Albright sides w/ our enemy & not America…” Albright publicly stated she is ready to register as a Muslim in response to President Trump’s call to ban Muslim immigration into the United States from certain nations. Your words not ours Ms. Zuhur, but thanks for making UTT’s point that it is a requirement for all Muslims to adhere to sharia which calls for jihad until the entire world is under Islamic rule. UTT does not teach all Muslims are the enemy of the United States. However, 100% of our enemy in the Global Islamic Movement state they are Muslims waging jihad to establish a global Islamic state (caliphate) under sharia. The delineating factor is sharia. Not every person who self-identifies as a Muslim wants to live under sharia or follow sharia, but 100% of our enemy in this war does. 100% of authoritative sharia obliges jihad, and defines jihad as “warfare against non-muslims.” The problem is two-fold: (1) Any Muslim who does not want to follow sharia can decide to follow sharia at any time – especially when threatened with violence from other Muslims; (2) Sharia obliges Muslims to lie if the goal is obligatory, and jihad is obligatory. Therein lies the problem – there is simply no way to determine which Muslims are our friends and which are not. In fact, the only Muslims who are potential friends of the United States are those who do not follow the Quran and Sunnah, as embodied in the sharia, which makes Ms. Zuhur’s reply all the more telling. UTT would not waste your time in sharing this exchange if that were the end of the story. Dr. Sherifa Zuhur is not just some random Muslim on twitter who defends sharia and designated terrorist groups. Zuhur is a former professor (2006-2009) at the U.S. Army War College’s Strategic Studies Institute who continues to be accepted in academic circles and was recently at the University of California at Berkley. In April of 2008, Zuhur published a monograph called, “Precision in the Global War on Terror: Inciting Muslims through the War of Ideas.” In this publication, Zuhur warns against attacking the ideology of groups like Al Qaeda, the Taliban, Salafists, and the Muslim Brotherhood because that would necessarily be attacking Islamic ideology. Exactly. In this regard, UTT agrees because Al Qaeda, the Taliban, Boko Haram, ISIS, the Muslim Brotherhood, and all jihadi organizations on the planet draw their doctrine from sharia. It is the basis for why they act – and they tell us so. And so does Dr. Zuhur. Sharia does not exist in a vacuum. Sharia comes from the Quran and the Sunnah, and last time UTT checked, the Quran and Sunnah are wholly Islamic. As we say at UTT – it’s all about sharia. The Global Islamic Movement has many lines of operations including suit/skirt wearing jihadis like ISNA, CAIR, ICNA, MAS, MSA, Dr. Zuhur and others who point to the violent jihadis and say something to the effect of “Well, at least we are not Al Qaeda or ISIS. We’re moderates.” The violent jihadis use their attacks and threats to drive weak Western leaders/nations into the arms of the suit/skirt-wearing jihadis. Not much comment needed here. Dr. Zuhur admits the leaders of Al Qaeda are correctly sighting sharia in furtherance of what they are doing. In addition, neither Al Qaeda nor ISIS have misquoted sharia in furtherance of their actions. Many muslims do agree with the views and objectives of Osama bin Laden as well as ISIS, the Muslim Brotherhood and other Islamic organizations/groups, because these are commands from allah repeated by their prophet Mohammad as “perfect” behavior for all Muslims to follow. Did we mention Al Qaeda is a terrorist organization? Muslims who want a caliphate here in the United States – which according to Dr. Zuhur is all Muslims – are enemies of the United States. America is a Constitutional Republic and Americans will keep it using all means necessary. Muslims who want to live under a caliphate can go to sharia-governed lands in ISIS-held territory. Working to establish one here is a violation of federal law, and an act that constitutes war against our Constitution and way of life. Since ALL jihadi organizations (Al Qaeda, ISIS, the MB, et al) continue to state publicly and in their internal documents their end goal is a global caliphate under sharia law and that it must be achieved via any means possible including political warfare and violence, and since Dr. Zuhur is defending that position, how are rational readers able to discern between Dr. Zuhur’s position and ISIS’s position? Sharia states the punishment for apostasy is death and the former professor at the U.S. Army War College agrees it should be prosecuted as such. This is utter nonsense. CAIR is Hamas. Hamas is a designated Foreign Terrorist Organization by the United States Government. Dr. Zuhur is one of a long line of jihadis and jihadi apologists in the military university system and on U.S. campuses teaching “Middle East Studies” and related topic. Is it any wonder that, with professors like Dr. Zuhur, the U.S. national security apparatus, and the Joint Chiefs of Staff under the Bush and Obama administration never identified our enemy, or even took the time to study the enemy threat doctrine – sharia? 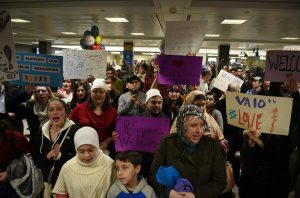 Should we be surprised that Dr. Zuhur has sided with the Al Qaeda, ISIS, or the Muslim Brotherhood – specifically Hamas (dba CAIR) – in opposing President Trump’s ban on immigration from seven Islamic countries? We at UTT are not surprised, and you should not be either. It is important for Americans to understand that as President Trump, his cabinet, and the U.S. national security apparatus begin to dismantle the jihadi network here in the US, they will be opposed by the hard left Marxist/socialist groups, their allies in the media, and by the jihadis themselves. There will be more crying Senators on television, hard-left/jihadi marches in the street funded by our enemies, and demonstrations allegedly about equal rights and equal treatment but actually excuses for violence, upheaval and revolution. Americans must know this is coming, get educated and get prepared. Support the bold leaders in the new administration and beware of the establishment types who are already coming to the defense of our enemies. This war will be won at the local level. Educate your elected officials and hold them accountable. Ensure your pastors speak truthfully about this threat and begin educating their flocks. Encourage your law enforcement leaders to get trained by UTT so they can map out the jihadi networks in their area and dismantle them, proactively find jihadis in your neighborhood, and defeat this enemy from the ground up. Having ensured a couple of times in the past aboard airliners, in response to the cabin announcement “we’re beginning our descent into Singapore”, that my seatback was in the upright position and my seatbelt was fastened, I’m reminded of how effective that country’s (otherwise ordinary) landing cards are with respect to controlling contraband-drug laws. I.e. at the bottom of each one there’s a skull & crossbones and an alert to the passenger that the penalty for violating said laws is “DEATH”. And rest assured it means what it says. Thus, the investigatory value of a false “Yes or No” answer to a similarly expedient systemic alert e.g. “Are you a Sharia-adherent person” would constitute permanent probable cause to arrest and deport. Furthermore, if as Fox News has tacitly implied, the emotionally distraught Senate minority leader from New York is as politically influential as he is friendly with the Obama appointee to the federal bench who stayed the president’s directive to detain one-ten-thousandth of the 325.000 individuals who entered the United States from abroad on 29.01.17, I.e. those who the president believed should have been subjected to heightened scrutiny in the interest of fulfilling his oath to protect and defend the American people in time of war, any such exchange would have seemingly equated to criminal collusion and thus constitute a binary flirtation with subversion or treason, I.e. a “high crime”. I would like to make maybe a foolish comment, no expert, but I have read parts of a Quran, dated 1957, printed from Pakistan (red cover). When the Quran calls for slaying infidels, is that not a statement or command.? If the Quran uses a word muhjadin ( spelling wrong) isn’t that a jihadi? If Allah want wants muslims to spread the Allah’s word around the world, isn’t that a caliphate..? I know deception is also included such as do not make friends with non-believers, and keep your heart hardended although you may act as a friend. I beleive it also has the penalty of death for apostasy. The comment above was meant to end, with asking why sharia is the only basis to define whether someone, such as a refugee or immigrant has the potential to act or be dangerous. Since it seems to also be in the Quran. Dr. Zuhar almost confirms it. At a teenager I was told all I needed or wanted to know about the not peaceful doctrine…by a transfer student…just never thought this would ever get unleased, or even considered to be a part of any government program without inquiry. Apparently the student told me the facts, the government got the fantasy, which is the deception,” allah is the greatest deceiver” all the while establising learning centers and mosques. The doctrine is very clever to gain acceptance which leads to potential subversion. Great article John which exposes the pathetically transparent “Good Cop, Bad Cop” routine played by these supposedly so called moderates. They attempt to differentiate themselves from the violent others yet their core beliefs and objectives are the exactly the same. As you’ve so clearly identified their only differences are the tactics used to achieve the same aims.